Citation Information: J Clin Invest. 2014;124(2):835-846. https://doi.org/10.1172/JCI70297. Cullin-RING ligases (CRLs) are a family of E3 ubiquitin ligase complexes that rely on either RING-box 1 (RBX1) or sensitive to apoptosis gene (SAG), also known as RBX2, for activity. RBX1 and SAG are both overexpressed in human lung cancer; however, their contribution to patient survival and lung tumorigenesis is unknown. Here, we report that overexpression of SAG, but not RBX1, correlates with poor patient prognosis and more advanced disease. We found that SAG is overexpressed in murine KrasG12D-driven lung tumors and that Sag deletion suppressed lung tumorigenesis and extended murine life span. Using cultured lung cancer cells, we showed that SAG knockdown suppressed growth and survival, inactivated both NF-κB and mTOR pathways, and resulted in accumulation of tumor suppressor substrates, including p21, p27, NOXA, and BIM. Importantly, growth suppression by SAG knockdown was partially rescued by simultaneous knockdown of p21 or the mTOR inhibitor DEPTOR. Treatment with MLN4924, a small molecule inhibitor of CRL E3s, also inhibited the formation of KrasG12D-induced lung tumors through a similar mechanism involving inactivation of NF-κB and mTOR and accumulation of tumor suppressor substrates. Together, our results demonstrate that Sag is a Kras-cooperating oncogene that promotes lung tumorigenesis and suggest that targeting SAG-CRL E3 ligases may be an effective therapeutic approach for Kras-driven lung cancers. 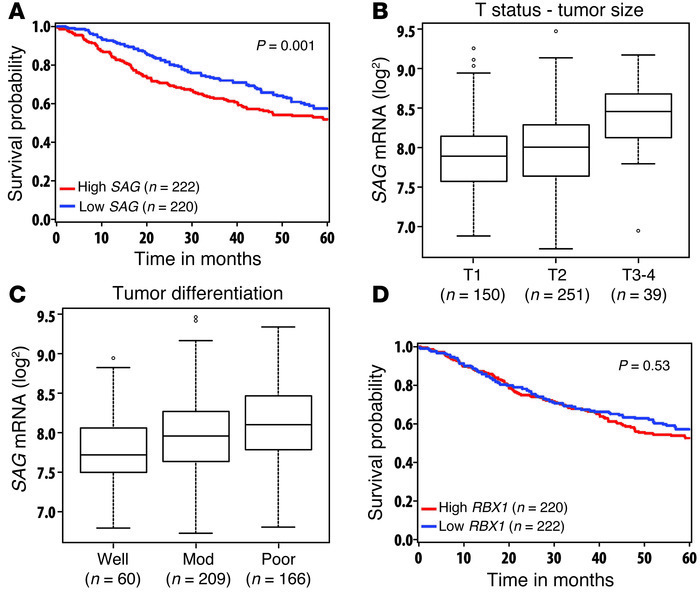 Overexpression of SAG, but not RBX1, correlates with poor survival of lung cancer patients, increased tumor size, and poor differentiation. (A) SAG mRNA expression versus the survival of lung cancer patients: Affymetrix U133A microarray data including 442 lung adenocarcinomas was downloaded from Shedden et al. (38). Robust multi-array average (RMA) normalized (62) and log2 transformed data were used in this study. Survival functions were estimated by the Kaplan-Meier method for patients with low and high expressions SAG (A) and RBX1 (D). Continuous expression levels were dichotomized using median splits (n = 220 and n = 222 in low and high groups in SAG [A]; n = 222 and n = 220 in Low and High groups in RBX1 [D], respectively). Patients with higher SAG levels had a worse overall survival (HR = 1.64; 95% CI: 1.22–2.19; P = 0.001, log-rank test). (B) SAG mRNA was higher in T3–T4 tumors as compared with T1 tumors (P < 0.001, t test). (C) SAG mRNA was higher in poorly differentiated tumors as compared with well-differentiated tumors (P < 0.001, t test). Definition of boxplot: the bounds of the box represent the middle 50% of all value, the line within the box is the median value, the upper line of the box is the value at 25%, the lower line of the box is the value at 75%. The upper and lower whiskers represent the maximum and minimum values. Few outlying values are located outside of whiskers. (D) RBX1 mRNA expression was not related to the survival of lung cancer patients (P = 0.53, log-rank test).